My current work focuses on building upon the findings of my dissertation to explore the impacts of the gendered nature of European economic governance. I am interested in questions of authority and legitimacy, as well as with broader questions on the contemporary status of European integration. My work draws on intersectional feminist approaches. I currently teach modules on European Integration, European Union Policy Making, British Politics and British Political Economy at the University of Warwick. I am interested in developing innovative pedagogy, with an attention to the variation in learning styles of students. I have used simulation, project based and peer led learning approaches. There is plenty being written about Brexit at the moment, with columnists and pundits rushing to pontificate on why people voted the way they did, what will happen now, who is to blame. It seems, at times, like they are hoping that volume and certainty will cover up their embarrassment at getting it wrong, at being frightened and confused and unsure. Here I’ve collected some links to readings that I’ve found better than the rest. Some were written before the result was announced in the bleary-eyed hours of Friday mornings, some have come in the days that followed. I’ve interspersed some of my own thoughts, though these are very much of the “thinking out loud” variety. If you’ve come across anything good I’ve missed, do let me know! To begin, you can never go wrong with having a read of what Mary Robinson thinks about everything – http://www.irishtimes.com/news/ireland/irish-news/mary-robinson-brexit-could-have-domino-effect-1.2700828? In the course of your pub arguments about what Brexit means, you’ll definitely hear people bringing up Article 50. These two articles do a good job of explaining it. The Jack of Kent blog is from after the vote, Gavin Barrett’s is from before. It is worth trying to bear in mind the power (and inclination) of the EU to lean towards flexibility when it wants to. The doctrine of muddling through may yet rear it’s head, should it become in the interest of key powers in the EU. ….well. There has been little enough written about gender since the result (that I’ve seen). There is also a clear male over-representation in the op-eds and panels around Europe and wider. (Manels live on). “Even when it is touted by all the propaganda in the world, a cage remains a cage, and a cage is unbearable to a human being in love with freedom.The European Union has become a prison of peoples” – That Marine Le Pen can talk about a Europe of cages and prisons, and not be referring to the barbed war, militerised borders, and violently patrolled refugee camps and the suffering and death caused by the European migration/refugee policy shouldn’t be surprising to anyone familiar with the rising right. But her piece is worth reading to gain some insight into the positioning of these groups in the coming months. http://www.nytimes.com/2016/06/28/opinion/marine-le-pen-after-brexit-the-peoples-spring-is-inevitable.html? Really this section could just have been based on a search for any articles using the phrase “turkeys voting for Christmas”. A big problem with so much of the post-result analysis has been a refusal to consider voter motivations in anything but economic terms. This is not unique to the UK or Brexit, it is a constant in elite level rhetoric that seeks to undermine the agency of voters. If voters don’t vote according to economic self interest they must be duped, fools. Never mind that economic self interest is actually quite difficult to define and predict. But plenty of people vote in spite of the risks to economic well being, some of the reasons are abhorrent, like racist motivation, some are “irrational” like a desire to reject the establishment, and some are based in emotional commitment to certain ideas (like sovereignty, but also occasionally like equality or empathy). Anyway, I am thoroughly fed up with articles that refuse to engage with analysis of non-economic motivations. As news breaks of another horrific, and almost inconceivable, level of human death and suffering in the mediterranean it can be very easy to distance ourselves. [http://www.bbc.com/news/world-europe-32371348] The water where these people drown can seem very far away from our little island. But this distance is false. It is dishonest. These people died because they attempted to enter Europe. It was European policies that helped create the circumstances that drove these people. And it is European policies that made that journey even more dangerous. There is a common experience of being an EU member, that makes it difficult for us to comprehend ourselves as both drivers and recipients of EU policies. When discussing issues that impact on us, like agriculture policy, austerity, or consumer laws we are fully versed in the grammar of the EU. But when it is others who are at the end of EU policy, we forget that we are the EU. It was decisions made in Brussels that killed these people. Decisions made with our representatives present. With our representatives’ agreement. With our agreement. But we do not debate this. We do not ask these representatives why they agreed to make it harder to save lives, we do not make it an election issue. This year is worse than others. This is because the Italian government, after spending huge amounts patrolling their seas, stated the cost too great, and begged the EU to take responsibility. They agreed, and replaced those patrols with a paltry presence utterly unsuitable for the scale of the task. This is the same Italian government grappling with austerity controls from Brussels. With the spending limitations drawn from the Fiscal Compact Treaty that we voted to approve. Irish politicians don’t talk about the deaths of migrants, of men, women and children, on the EU’s borders. They don’t like to talk about that. But, it makes sense. That would mean talking about bodies, and as we know, the Irish government hate to talk about bodies of anyone they don’t immediately recognise as like them. Trinity Metafizz Society Panel Event – What is this thing called gender? Tonight I’m taking part in a panel discussion in Trinity. I’ve uploaded my speaking notes here for anyone who’s interested! I’m presenting on feminist research methods and EU governance in the School of Politics and International Relations today. Here is a copy of the paper. Please note this is a draft/working paper, and so should not be cited without permission. By that same token, feedback is very much welcome! From looking at the majority of news outlets, it would seem that all of the drama regarding the European Commission is over. Junker was appointed, Cameron was disappointed, and now Brussels trundles on with its work. However, despite the contest for President of the Commission been long concluded, a new political row may be emerging. 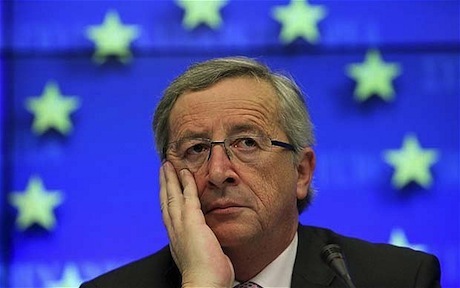 The European Parliament – that institution which staked a strong claim for itself in the Junker debate – is threatening to reject the proposed commission if there is not a sufficient number of women. What sort of crazy demand is this from the feminists of the Parliament? They are seeking a Commission that contains 10 or more female members. 10 or more. 10. Ten. That’s not even half. As it stands, there are four women nominated, with five countries left to nominate. 19 men have been nominated so far. No matter what your view on Europe, it is clear that the Commission plays an important role in setting the agenda for EU policy making, and it also plays a key part in setting the norms of that policy making process. To have such an institution resembling a board room from Mad Men simply isn’t good enough in a European Union that claims to be a gender equality champion. This is clearly a sign of a collective action problem. As individual member states each nominate one commissioner, they do not feel the need to look to gender equality (whether they would or not if they were nominating more than one is possible but unknowable). While Junker, and indeed the other candidates for Commission President, called on the member states to take gender into account when nominating, it seems no one thought he meant them. Is this simply a coincidence? Could it just be that it happens that the best candidate in 19 of the member states are men? Of course this is possible, but there are many, many reasons to be sceptical. Several EU member states have never had a female commissioner. Are we to really believe that in Portugal there has never been a woman who was best placed to be commissioner? Or Belgium? Of course, the Commission is not alone in having this problem. The group photographs following European Council meetings have a significantly male tendency. This represents the situation in most EU governments and parliaments. To believe that this disparity is down to meritocracy is a profoundly sexist view. Evidence from studies of political participation in Europe and elsewhere points to various obstacles to female participation in politics. Key among these is the question of role models. As men have dominated the corridors of power for so long, it can come to seem natural that they would continue to do so. This makes it more difficult for women to imagine themselves in such positions, and makes decision makers associate men with positions of power in a way that encourages subconscious bias when appointing people to various positions – like to the Commission. That such bias is subconscious may lead us to forgive it. However, the secret is clearly out – why else would several countries be establishing, or considering establishing political quotas of some sort? Why else would Junker have made such a public call for gender to be considered in the nominations? The exclusion of women from positions of power is perpetuated by a vicious cycle. It leads to poorer representation. It leads to worse decision making. It continues the false notion that there is an innate connection between decisiveness, power and masculinity. It should not be acceptable to the European Parliament, it should not be acceptable to the people of the EU, and it certainly should not be acceptable to the governments of the member states. I really wanted to like this book more than I did. I like the idea of it, introducing often intimidating theorists but without speaking down to the reader. There are some high points – I loved the inevitability of the chapter on Zizek, which seemed like it was there on anyone but the author’s wishes. I also enjoyed the critique of Zizek, and I don’t think there is enough of that sort of thing in “popular” leftism. The other chapters were good, clearly argued and gave good introductions to key ideas. The underlying argument of the potential for reform to co-exist in the process of revolution is one I’m very sympathetic to, and it was well made. Enough praise then. In the introduction Kunkel attempts throws a bone to us pesky feminists, by flagging that he will not be dealing with the issue of gender in society, along with big questions of the environment or technology. He also doesn’t deal with race or the idea of the state/nation, but doesn’t flag that up. When this caveat is followed by celebration of Marxism’s comprehensiveness, it’s hard to read that certain issues (class and the questions of traditional economics) are viewed as more important than others. Throughout the book, without setting out to count, I think there are three mentions of women in total. One is the author’s past flatmate, another is Carmen Reinhert, who gets a not for a study she did, and the last is Anne Applebaum who is quoted as an example of a the establishment talking down to marxists. One of the strengths of the book is it’s breadth of reading, this is a bit ridiculous. In a book that’s meant to be about generating ideas and thought about what our shared future post-capitalism might look like, it feels very white and male. It is not simply that diversity should be included, though a book that seeks to take part in forming progressive discussion shouldn’t avoid diversity. It is simply untenable to believe that race, gender, nationality, sexuality, (dis)ability and other factors aren’t massively implicated in the construction of modern capitalism. American capitalism is built on racism (http://www.theatlantic.com/features/archive/2014/05/the-case-for-reparations/361631/), and the occasional references by Kunkel to the role women played as a reserve workforce simply does not go anywhere near far enough in explaining how differentiated genders structure capitalism, in particular structuring the ability for holders of capital and holders of power to exploit others. In closing the book, Kunkel quotes Frederick Jameson -“the way in which one isolated cause or issue , one specific form of injustice, cannot be fulfilled or corrected without eventually drawing the entire web of interrelated social levels together into a totality, which then demands the intervention of a politics of social transformation”. I wish he would pay more heed to this, and would engage in work that doesn’t seek to find the answers in solely economic/class based analyse, and appreciates instead the complexity of the system we live in, and the necessary complexity of any future world.